Top 3 in championship flight were Josh Durso, George Mander, and Cliff Stein – followed by Skoot Stein, Jake Stephan, and Tom Lagana. Durso’s final round 80 was enough for a four shot victory after holding off a surge from George Mander, who cut Durso’s 7-stroke lead after the 11th hole down to 3-strokes heading into 17. The Senior Championship was decided on the last hole. Jack Stenberg had a lead heading into the final hole, but spiked an iron to the right on a downhill lie, sending his ball O.B. costing him the tournament. 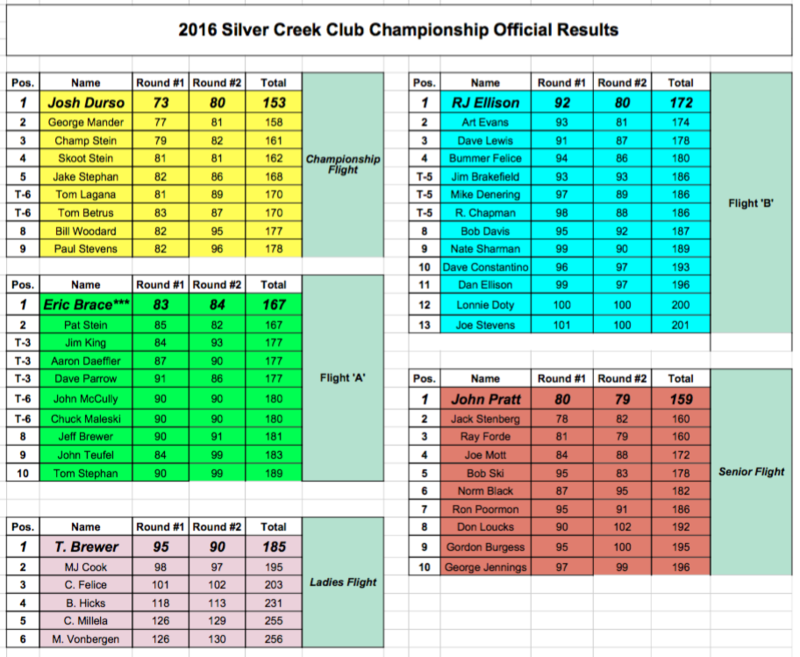 After a challenging day of play at Silver Creek Golf Club the final field has been set for the second round of the 2016 Club Championship. Fast greens, tough pin placements, and a course that was immaculately prepared by Silver Creek Golf Club Superintendent Paul Clark made for a challenging day of play across the board. After one round Josh Durso has a four stroke lead heading into the final round. Durso carded a 2-over 73 to lead the field, with George Mander firing a 6-over 77. Cliff ‘Champ’ Stein fired a 79 to enter the clubhouse in third place. Skoot Stein and Tom Lagana both shot a pair of 81’s, who will be paired together in Sunday’s second-to-last grouping. Jake Stephan, Paul Stevens, and Tom Betrus fired 82 and 83’s respectively to round out the championship flight. 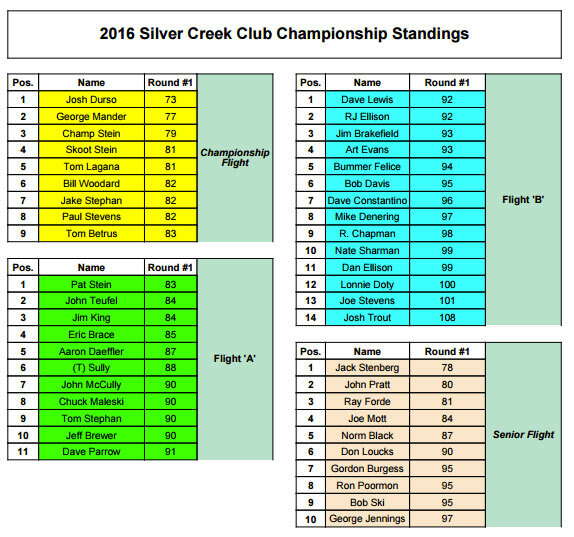 Those individuals will battle for the title 2016 Silver Creek Club Champion on Sunday with the final three groups teeing off at 9:42, 9:49, and 9:56 respectively. Pat Stein, John Teufel, Jim King, and Eric Brace managed rounds on Saturday that will allow them to compete for the ‘A’ Flight title. Dave Lewis, R.J. Ellison, Jim Brakefield, and Art Evans are all within two strokes of claiming the ‘B’ Flight title, which will play out on Sunday with tee times beginning shortly before 9. An ultra-competitive senior flight has Jack Stenberg battling several close contenders for the title Silver Creek Senior Club Champion after shooting a 78 on Saturday. Stenberg will have to fend off John Pratt and Ray Forde, who are just 3 back.